TRIVIA of Noh : Q137 : Why is the back panel called kagami-ita? | Home | Trivia | Q137 :Why is the back panel called kagami-ita? Why is the back panel called “kagami-ita”? When you enter a Noh theatre, the first thing to catch your eye may well be the large pine tree on the back panel of the stage. The panel with the pine is called the kagami-ita (literally “mirror panel”), which is one of the fixed pieces of scenery. Whether the play is Noh or Kyōgen, elegant or sorrowful, the audience will watch it being performed in front of the tree. The reason for the name kagami-ita is generally explained with reference to the “Yōgō no matsu” (pine of the advent) at Kasuga-Taisha Shrine in Nara Prefecture. Yōgō means advent, or coming, of the gods and Buddha. 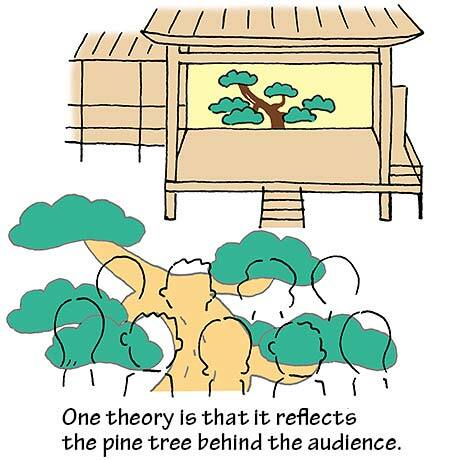 According to the historical explanation, the pine tree of an incarnated god at Kasuga-Taisha Shrine stood behind the audience, and the stage back panel reflected the tree like a mirror. Therefore, the actors were giving a performance to the god, rather than to the audience. While this sounds like a feasible theory, the kagami-ita was adopted as standard only after the Momoyama period, as discussed in Trivia 31. The argument that the historical explanation was created in a later period is also convincing. But it is true that the pine tree, which stays green throughout the year, goes well with any program. The art of Noh may also be related to other forms of Japanese culture, such as gardening and bonsai, in which we admire the contrast between the changing seasons and evergreen pine trees.